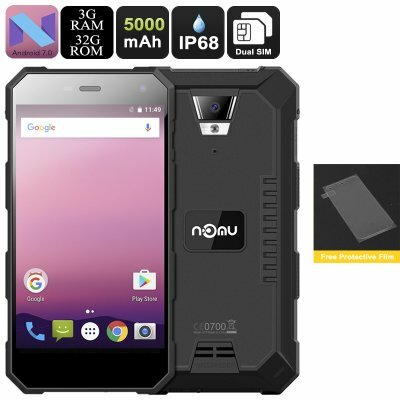 Successfully Added NOMU S10 Pro Android Phone - Android 7.0, Quad-Core CPU, 3GB RAM, 5-Inch Display, 5000mAh, Dual-IMEI, IP68, OTG (Black) to your Shopping Cart. The NOMU S10 Pro Android phone is a waterproof rugged smartphone that treats you to a wide range of outdoor features. If you work in a tough environment or spend many hours’ outdoors, this rugged Android phone is perfect for you. With its IP68 body, the NOMU S10 pro is resistant to water, drops, and dust. This means that it will work properly in virtually any environment imaginable. No matter where life will take you, with this rugged phone at your side you’ll always stay connected. To make sure that you’ll always be within reach to friends and family, the Android smartphone features Dual-IMEI numbers and 4G connectivity. The NOMU S10 Pro Android Phone comes with a 12 months warranty, brought to you by the leader in electronic devices as well as wholesale smartphones..